I started work on the blackwork body. I’m glad I chose a darker ground fabric. If I was working the pattern on white I’d consider backing it with something. I think it would be tricky to keep the tails on the back from showing through unless you were very meticulous about it. I added some running stitch temporary basting lines, partly to better keep count and partly to help sure the waste canvas doesn’t shift. That would be unfortunate! I’m considering double running stitch for the feathers. But vertical or horizontal? Or diagonal? And how solid would it look on 16 count fabric? Still thinking! This entry was posted in Blackwork, Cross-stitch, My work and tagged blackwork, cross-stitch, embroidery, rooster, x-calibre designs. Bookmark the permalink. Thank you for teaching me something new. I feel like such a dummy not thinking of the grid idea myself. I bought a counted cross stitch once. Was a map of the road that runs through Cades cove in Tennessee. Badly wanted it into a pillow. But I got so sick of counting the dang thing! You’re welcome! Though the counting is something of a pain even with the grid. I prefer uncounted work. I suspect by the time I’m done with the rooster I will be totally sick of it. But I do so love the design! 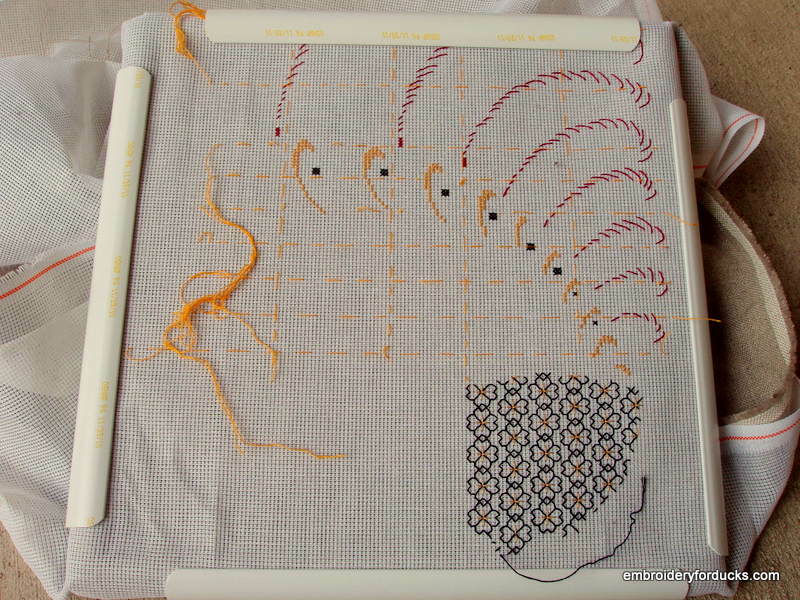 The blackwork is going well – it will look fabulous when it’s done! Lovely design! It’s coming along beautifully! If the white plastic frames slip place a piece of folded tissue round the canvas under the plastic. It gives a better grip & if you extend it slightly over the canvas it helps to avoid finger marks on the canvas. If you use the frame on some of the canvas you have already stitched you can discard the tissue or thin it as you go along.